Hope you all having a Good Day and a Good Weekend too....!!! Today i gonna clear you some of the questions that you think when you remember the topic " TONNE OF REFRIGERATION ", shortly TR. What is the value of 1 TR ? ?What does Actually TR means ? ?How the value for 1 TR derived and how it got to be 3024 KCal, ?? So, before clearing all these doubts and demonstrating the way to calculate required TR, i wish to present you the basics required to understand this topic fluently. How to Select a Condenser ? How to Select Motor capacity of agitator ? This term TR or Tonne Of Refrigeration has been started from US, and apart from US the cooling terminology is basically in the format of MW or KW. And whenever we start to discuss over the units of any figure then the most disgusting thing that leads us to confusion is having two types, one is British units and the other one is English units. All the British countries will keep on using the British units and the English countries will be using English or SI units, in between there will be some countries conducting debate over the units, what to choose without keeping to something consistently, because we want to know everything in this world, and in turn this will lead to confusion. What is a Short Ton and Long Ton ?? So its Clear about Short Ton and Long Ton. Actually 1 TR holds the value 3024 KCal. 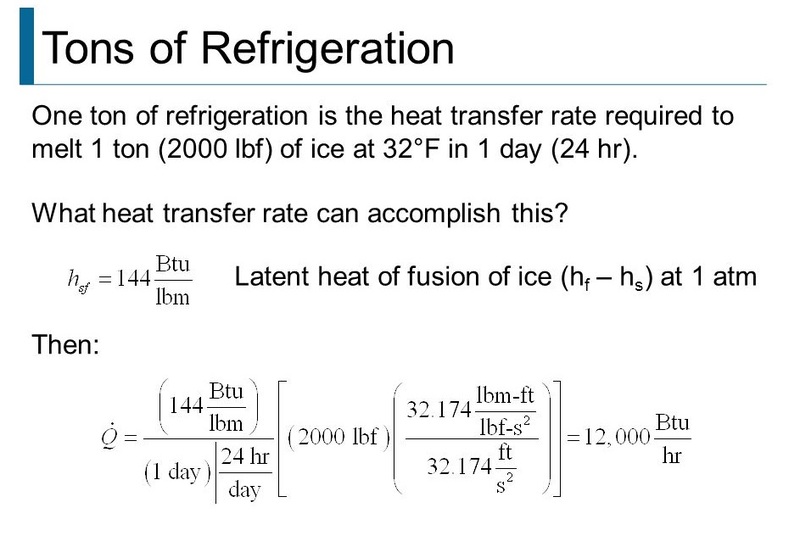 It means that Energy required or to be removed to freeze one ton of water to Ice in one day i.e., 24 hrs, So mathematically 1 TR means 288,000 Btu are required to make one ton of ice, divide this by 24 hours to get 12,000 Btu/h required to make one ton of ice in one day, In Simple words one 1 TR means energy required for change of phase from water at 0°C to Ice at 0°C. In English terminology, 1 TR is 3024 KCal. Learn How the value of 3024 KCal or 3.517 KW derived.....!! 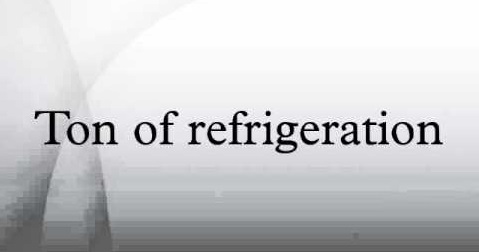 1 ton refrigeration = 200 Btu/min = 3.517 kJ/s = 3.517 kW = 4.713 HP . So, i think you got answers for the hidden questions, So now i'll show you how to calculate the TR required for an operation. Let it, i need to cool 350 L toluene vapour which is produced at 35°C under 710 mm Hg vacuum, so how much TR required ?? Soln. Volume to be cooled 350 L toluene. Mass to be cooled 350 L x 0.868 Kg/L = 303.8 Kg. Qs = 303.8 x 1.72 x 5 = 2612.68 KJ = 625.04 KCal. QL = 303.8 x 351 = 106633.8 KJ = 25510.48 KCal. So the Total energy is Q = Qs + QL = 625.04 +25510.48 = 26135.52 KCal. So Now the required TR is 26135.52 / 3024 = 8.64 TR. So for the above operation of cooling a 350 L toluene vapour at 35°C which is produced at 710 mm Hg, i need 8.64 TR. So, simply TR required = Total Heat Load / 3024. How to calculate Reactor Heat Transfer Area ? How to calculate Distillation Time cycle ? How to select a Vaccum pump ? What is the correct definition of TR ?? 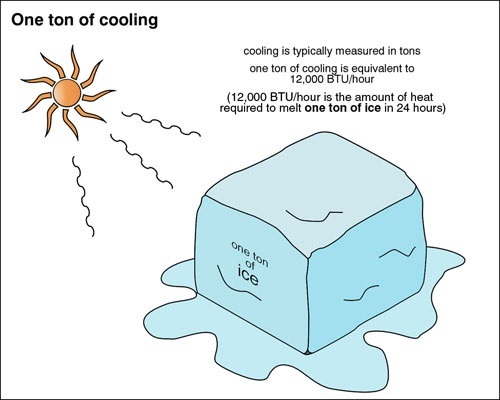 Energy req to melt one ton of ice to water.. So my doubt is both freezing and melting emphasis same meaning ??? I think the way TR is described is not correct . The Term TR is applicable for cooling or Heating irrespective of ICE formation . In room airconditioner capacity is defined in TR where the formation of ICE is not happening . TR means removal of 12000 BTU / Hr . This is only giving us a value of the heat energy that our system can extract. Ice formation is not necessary. 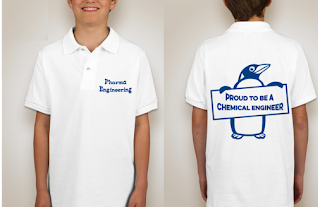 The heat transfer is also limited by the design and operating parameters. Exactly, but if you gonna extract 3024 KCal of energy from the subject system, the phase will change. Usually TR is used to define cooling rates, and being frank until now i haven't heard that TR is applicable for Heating also. Can I used TR to calculate for the cooling tube capacity with information of dT of product temperature hot (in) to cold (out), weight of product pass through and time needed for all the product to pass through? Go through this, if you need any help mail me or comment here. Ajay Sir, please let help to calculate the TR require to cool down petrolium jelly from 65 deg.C to 12 Deg.C. in 5 minutes. Total volme is 60 kg. 1 TR = 12000 BTU / Hr = 3024.12 KCal / Hr = 3517.2 Watts. Still if any queries please reply back. But how you are calculate I don't know could you expalin little deeper. Q = M x Cp x dT = 100 x 920 x ( 3.744 / 4.187 ) x 5 = 411330 KCal. M = Mass flowrate = Volumetric flow rate x density = 100 x 920. Specific heat, Cp = 3.744 KJ/Kg.K = ( 3.744 / 4.187 ) KCal/Kg.K. So, now Q = 411330 KCal. TR = 411330 / 3024.12 = 136.016 TR. Note: Earlier your query is not that much clear, so i've considered calculating Total energy including Latent heat. Now its clear for me. Still any queries feel free to comment / message. Density i've considered as 920 Kg/Cu.m, since -20 degC brine will have a specific gravity of around 0.92. Same parameters units and all others in details. Give the formula along with any excercise, it will be good. May be you already know refrigeration means driving away the heat from low temperature medium to high temperature medium with some external work done on the system. COP = 278 / ( 323 - 278 ) = 6.17. In your above writings in cooling of 350L toluene vapour problem you have written "QL = 303.8 x 351 = 106633.8 KJ = 25510.48 KCal. "..How it is so sir? Oh sorry it is the latent heat of vaporization of toluene..
in this step how did you taken 351? 351 is Latent heat of toluene in KJoules. 8.64 TR is it per day or per hr.? Reactor jacket heat transfer is 11.89sq.mtr, required cooling is -40C for process, How much TR required with 40% methanol circulation to rector jacket. dT = Kf x m, m is molality of solute, Kf is the molal freezing point lowering constant. If any queries pl comment or reach me through contact me page. How to calculate tr for reactor..
total of 10 reactors, each 10 KL, Occupancy of 80% each. So, it will be =8000 x 1 x 2 x (30 - (-5) ) = 560000 KCal. For 10 reactors, it will be 560000 x 10 = 5600000 Kcal. Now TR = 5600000 / 3024 = 1851.8 TR ~1900 TR. (which is so heavy). Theoretically we need to consider only Ql, but practically while cooling a vapour, it will condense followed by cooling too, thats why physically we need to consider the summation of both. Total heat load = 60 x 0.72 x (65-12) = 2289.6 KCal. Total TR required is 2289.6/3024 = 0.76 TR. Now tell me what are the utilities available to cool the jelly and what type of vessel are you using for cooling the jelly. How to calculate per day production rate of a plant.